Ooohhh ballet! I've never seen legitimate ballet before! So this one will probably my chance to see real ballerinas on stage. I am stoked! One of the oldest and most active art organizations in Cebu will be celebrating the farewell performance of the International premier danseur Nicolas Pacaña. 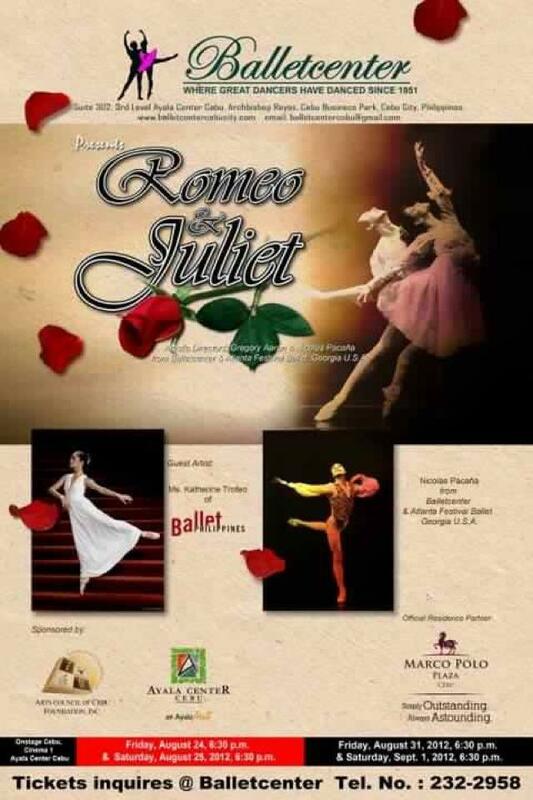 Ballet Center of Cebu, will be producing the full- length ballet masterpiece, “Romeo and Juliet” on August 24, 25, 31 and September 1 at the Onstage Cebu, Ayala Cinema One. Catch this exciting treat and more only at Cebu’s premiere shopping, dining and entertainment destination, Ayala Center Cebu. For more information, contact Ayala Center Cebu Concierge at (032) 516-2035 or (032) 231-5342. You can also visit the website: www.ayalamalls.com.ph or “like” the official Ayala Center Cebu on facebook (www.facebook.com/AyalaCebu) for more details on upcoming shows and events.